A huge thank you Carol, we are in love with our new garden. 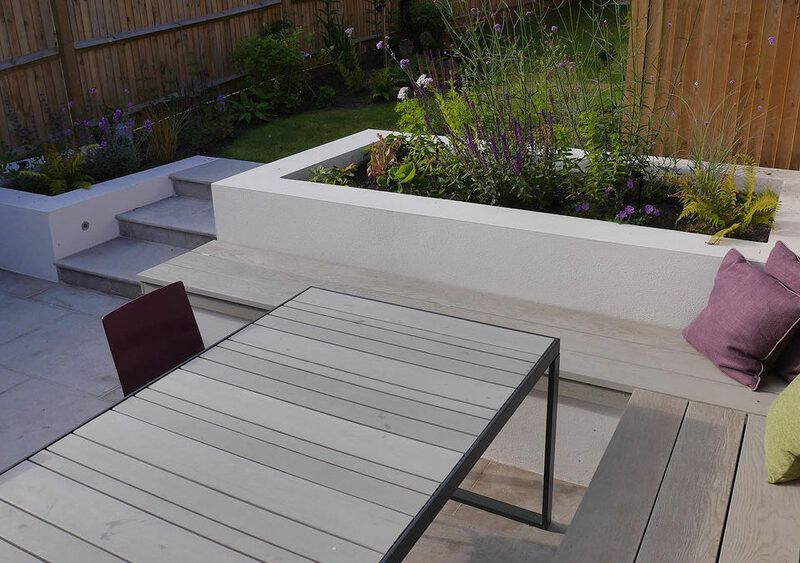 Presented with a bland ‘new-build’ garden, Carol managed to completely transform the look and feel of it to make not only a stunning garden, but an extra room for our house. The nature of the space Carol created has literally transformed our home life; from going outside once or twice a year for a barbecue, to having the doors open every single day. From the first meeting, we felt relaxed and at ease with Carol’s professionalism and extensive knowledge. When presented with ideas on landscaping and planting we immediately had absolute faith that Carol would create something spectacular. She produced drawings and animations to bring her ideas to life, enabling us to picture the space and make more informed decisions about the final appearance of different landscaping options. Carol was attentive throughout the process, liaising with the hard landscaping company and electricians, checking on progress and keeping the project on track. We have had a glorious summer enjoying watching the plants mature and bloom and now can’t wait to see the changes through the seasons.